The train transporting George H.W Bush around the city. Photo by: Kamryn See of the Bearchat Newspaper. This Thursday, Dec. 6, former President George H.W. Bush’s casket will travel along the Union Pacific Railroad in his presidential “Bush 4141” train. The train’s route will go from Spring to College Station and will approximately last for two hours and 45 minutes. During the 75-mile train route, the public will be able to view “4141” as it travels from Spring to College Station. And between 1:10 p.m. to 1:40 p.m, Klein ISD students from Klein Oak High School, Hildebrandt Intermediate, Schultz Elementary, and Northampton Elementary will view the train as it passes in front of their schools. JROTC students from Klein Oak will also be expected to be in their dress uniforms, lining the track, and saluting. 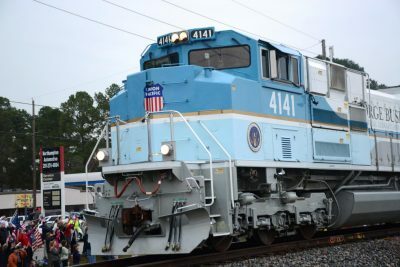 After “4141” train completes its route, the late president will rest at his presidential library near Texas A&M College. The George H.W. Bush Presidential Library and Museum contains exhibitions and archives about the late president. Near the Barbara Bush Rose Garden and across a pond lies the family gravesite. At the gravesite, the 41st president will rest alongside his late wife, former First Lady Barbara Bush, who died earlier this year. Beside him also lies his late daughter, Pauline Robinson Bush, who died from leukemia 65 years prior.